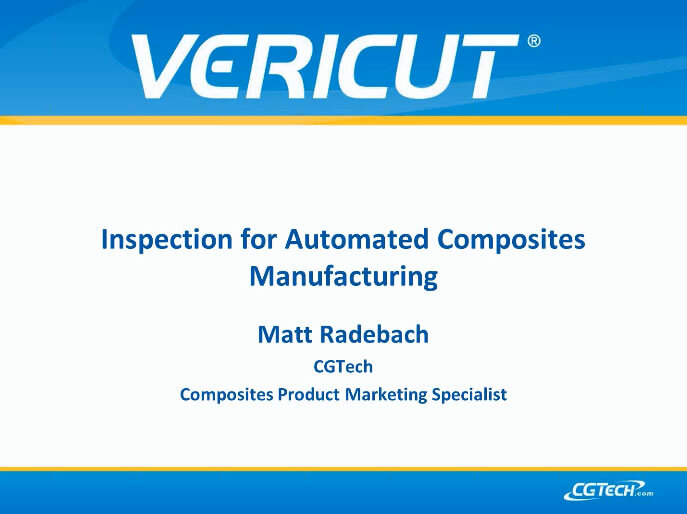 Manual inspection of automated composite manufacturing can account for up to 50% of the overall lamination time. Diligent planning with the use of inspection aids provides the opportunity to improve the efficiency of required inspection. Going forward, automated ply inspection has the potential to eliminate the need for manual inspection of the laminate. This webinar will provide real world examples of automated laminate inspection planning, available manual inspection aids for automated composite manufacturing machines and introduce potential automated ply inspection techniques to eliminate the need for manual inspection. Primary topics (what the registrant will learn): -Inspection Planning for Automated Composites manufacturing -Potential Automated Inspection techniques -Techniques to aid in manual ply inspection.